Smile coach Cheika, the Wallabies actually beat the Springboks! 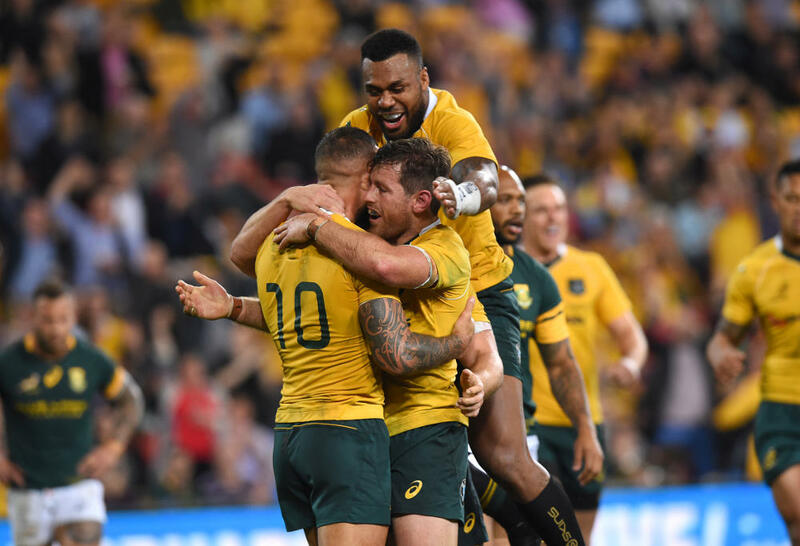 The tweet referenced the relief in the Australian rugby community with the Wallabies’ 23-17 victory and gave a mild serve to coach Michael Cheika’s for his under-stated enthusiasm about the result. Only two weeks ago Cheika gave a very bitter media conference in the wake of the Wallabies thumping by the All Blacks. This was a chance to be a bit enthusiastic about a rare (the only one, in fact) Test victory this year. 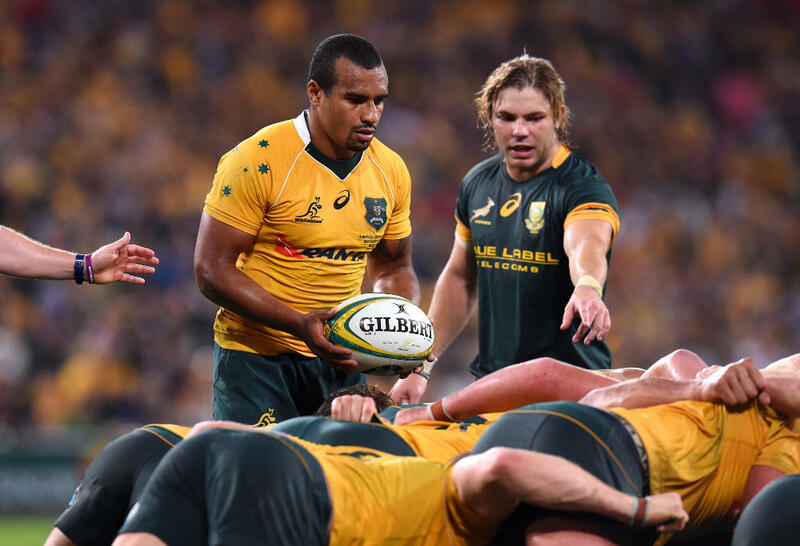 » Re-live the Wallabies victory over the Springboks with The Roar’s live blog. I think Ella’s point is that the Australian rugby community has become disillusioned with the losses (look at the smallish crowd at Brisbane), with the style of play of the Wallabies and the referee-bashing Cheika has indulged in. In this context, a victory should have been seen to be something to enjoy. @qantaswallabies well done can we see Michael smile? And there are a number of things to enjoy about the win. First, the Wallabies actually won a Test this season. There is only one further Test in Australia this year and the rest of the Tests are away games. There were fears before the Brisbane Test that the Wallabies could lose all their Tests this year. Moreover, another Test loss would have been the seventh in a row for the Wallabies. The last time this happened was in 2005 when Eddie Jones was in the process of being sacked. Before that, we have to go back to 1969 for a similar run of Test losses. Winning Tests is difficult at the best of times. When a team like the Wallabies this year has a sequence of losses, the losses can become self-generating. The tendency to change the team’s style takes root. This happened in Wellington with the reversion to thugby tactics. At Brisbane, the Wallabies thankfully gave away this thugby nonsense. They concentrated on hard-shouldered defence and some slick running and passing at times. As well, desperate selections can be made in the mad hope that they will somehow provide the solution to the run of losses. Again, thankfully, Cheika kept his head with his selections. This is why in last Monday’s epistle on The Roar I argued that a “well-selected and well-coached” Wallabies side would defeat the Springboks. In general, Cheika avoided mad-cap selections. He brought in Dean Mumm, a necessary front line lineout jumper if the David Pocock/Michael Hooper ‘Pooper’ was to be maintained. Mumm provided the target for Stephen Moore to throw to. Kane Douglas actually did some jumping. And the Wallabies lost only two of their 12 lineouts. And some good coaching was done, as well. ForceFan on The Roar on Sunday provided some fascinating statistics about the changes in the way the Pooper Option operated in this Test. Hooper made 12 tackles and Pocock five. Pocock was involved in 54 rucks to the 29 for Hooper. Pocock made ten carries for 22m and three passes. Hooper made eight carries for 9m and five passes. These statistics suggest to me that Cheika is developing a combination of the number seven and number eight game to be shared between Pocock and Hooper. He even had Pocock jumping for and winning a lineout. Pocock did get smothered after his jump and catch and was penalised for not releasing, however. The point here is that we can see with the way the Pooper option is being played out that there has been some thinking about the roles of the two players, who are essentially number 7s. And that this thinking was put into a plan that seemed to have worked for the Wallabies. Warning – there is still some work to be done to perfect this system, though. The Wallabies lost eight of their 76 rucks. This compares with the Springboks losing only four of their 73 rucks. My feeling is that Cheika is waiting until next year, when Pocock is on sabbatical leave, to develop a big number eight, something the Wallaby pack needs if it is to be competitive during the 2019 Rugby World Cup tournament. My guess is that the ruck losses at Brisbane are more a reflection on the general lack of shoulder and grunt in the play of Mumm rather than deficiencies with the Pooper Option (which apply mainly in the scrum and ball-running). Mumm’s play around the field has always been the least impressive part of his game. He is, though, a terrific lineout forward and, right now, he was worth his place in the current pack because of the way his jumping complements the Pooper Option. Alan Jones used to talk about the necessity of team’s having a proper shape, if it wanted to be successful. Mumm’s selection gives the Wallabies a useful lineout shape, because he is a very good jumper. And with a successful lineout, the Wallabies were able at Brisbane to set up back movements that were denied to them (or the opportunity was denied) against the All Blacks, particularly. This brings us to the second enjoyable aspect of the Wallabies performance which was their execution, especially in the first hour or so of the Test, of some fine ensemble back play. Bernard Foley’s try to take the score out to 23-14 for the Wallabies came after 18 phases of play. Before this, the Wallabies backs had revealed some tricky and effective running plays that involved doubling around runs and cut-out passes. 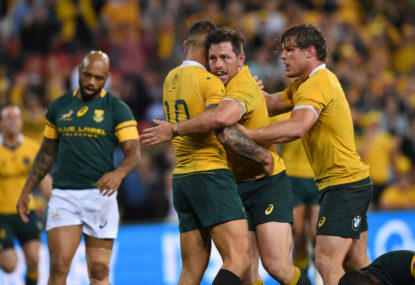 In previous Tests, the Wallabies ran out of ideas after several phases and tended to kick the ball away, something that the Springboks did continually at Brisbane, in fact. This extended phase play owed a lot to Quade Cooper who brought his A-class passing game to this Test. Readers of The Roar will know that I’ve been critical of Cooper, essentially after his great play for the Reds in winning the 2011 Super Rugby tournament. We needn’t go into the history of all of this. Suffice to say that since he has come back from Toulon, he has been a model team player off the field and an improved player, especially at Brisbane, on the field. We even saw him join the circle of players from both sides who linked arms together in prayer after the Test. I know some sports writers hate this sort of Christian exhibitionism. But I think it is better for players to express their Christian beliefs, surely, in this way than for other form of exhibitionism that are totally anti-social. But getting back to the rugby, I was impressed with Cooper’s clever passing and his instinct for finding weaknesses in the defence for his runners to exploit. These skills opened possibilities for the Wallabies to exploit, and played a big part in their victory. Cooper, for all his exasperating faults, is the only player of genius currently eligible for the Wallabies (and this includes the disappointing, coasting Israel Folau). Without someone with Cooper’s occasional magic, the Wallabies are a totally predictable side with no great hope of breaking down well-organised defensive systems. This brings us to Bernard Foley being selected to play at inside centre. The most supportive thing I can say about this exercise (which Cheika says he is going to continue) is that at Brisbane it wasn’t a failure. It did not cause a Wallaby loss. The home side were lucky that the Springboks never really ran at the Cooper/Foley alignment. Nor were there bombs directed at them when they were defending in the outside channels. It seems to me that in the long run the challenge of hiding two smallish defenders is going to expose the Wallabies to defensive dilemma’s that can’t resolved. I like the All Blacks solution of starting one designated playmaker and keeping another one on the bench. I would not deem the two playmakers option, as it played out at Brisbane, as a success, anyway. After all, the Wallabies scored only two tries against a very poor Springboks side which also scored two tries. As well, the best runner in the Wallabies back line, Samu Kerevi, a natural inside centre, would have been more dangerous in his line-breaks if he had the chance, as Foley did, of running off Cooper’s passes. I know that Cheika won’t do this but a more dangerous Wallabies back line would see Dane Haylett-Petty shifted to fullback, Folau played on the wing (his position for the Brisbane Broncos), Kerevi at inside centre and Kuridrani at outside centre. Once again, we come to the issue of the proper shape of the backline. The two playmakers option, for instance, does not have to be the number 10 and 12 filling the role. The All Blacks use multiple players as the first receiver, along with their number 10. Often it is Ben Smith, the fullback. Sometimes it is a forward, like Brodie Retallick or Kieran Read. Other times it is an inside centre like Ryan Crotty. The third reason for joy from Wallabies supporters, and a smile on Cheika’s face, is that Stephen Moore finally got his relationship right with the match referee. This time something worked. The Wallabies won the penalty count 11-8. Moreover, the Wallabies victory was only the second time in eight Tests with Owens refereeing that they have won. Respect from the Wallabies captain resulted in respect from Owens. And this is the point that Cheika and Moore have had to learn the hard way. It does not work the other way around. If a referee is shown the disrespect that Moore has shown to them this year, then the Wallabies will suffer the consequences. We had an excellent example of this during the spirited All Blacks 57-22 win over the Pumas. Aaron Smith had chirped away at the South African referee Craig Joubert so often that not long after half-time, after yet another Smith intervention, Joubert told him that the next time he interjected he would be penalised. Minutes later Smith was subbed by the All Blacks coaches. Rather than this Smith-like, smart-arsed chirping that infuriates referees, Moore was subdued and careful with his interventions. Example. The first scrum of the Test at Brisbane came after ten minutes of play. The Springboks were penalised. As the team broke away into their respective positions for the penalty to be taken, Moore had some quiet words to Owens. “I’ll look into it next time,” Owens told the Wallabies skipper. As I have said before in this matter of the Wallabies and the referees, if you show respect, the referees will respond with respect. If you are disrespectful they will treat you accordingly, in a similar manner. Hopefully this good coaching will continue in the next eight Tests the Wallabies play this year, and for the next Test at Perth against the Pumas. For the reality is that the Wallabies will have to be on their game to defeat the Pumas. The Pumas lost 57-22, eight tries to two. Forget these statistics. The All Blacks were tested in a way that would have destroyed most other sides in the world rugby. The Pumas scored 19 points and two tries in the first half of the Test, more points and more tries than the Wallabies did in their two Tests against the All Blacks. Among the statistics coming out of the Test a couple could be significant for the Wallabies. The All Blacks conceded 15 turnovers to the nine by the Pumas. And the All Blacks lost two lineout throws to none lost by the Pumas. These two lineout losses were the first in The Rugby Championship by the All Blacks. When the second loss occurred, Dane Coles was hooked and the the young Codie Taylor sent on to return the normal order of things for the All Blacks. One of surprises at Brisbane was just how lacking in aggression the Springboks lineout was. Similarly, around the field the Springboks were mediocre and lacklustre. My guess is that the Lions squad would have given the Wallabies a tougher match than the Springboks did at Brisbane. Certainly, the Wallabies cannot expect the Pumas to be as third-rate as the Springboks. In 2012 when Graham Henry was co-opted to help the Pumas adjust to the modern rugby game as played by the All Blacks, Wallabies and Springboks, he told them they had to make a major change to their thinking about rugby. They had to move away from the obsession with set piece victories, especially the machismo of the scrums, and become obsessed with scoring tries. Henry was in the stand at Hamilton watching a Pumas side play, in the first half, about as well as any side has against the All Blacks in recent years. It was magnificent rugby from them. In their rolling series of plays in the first half they turned the brick wall All Blacks defence into sand barriers with inside passes, using wingers in close, dominating the rucks and off-loading before, in and after the tackle. This was rugby of a quality and intensity and skill that would have destroyed any other team than the current All Blacks who are already shaping up to be one of the great sides in the history of rugby. One of the reasons for this is that the All Blacks are turning rugby into a basketball type of passing game over-turning the historical bias of the game towards football. The basketball model worked in the end. But it took some magnificent play from Beauden Barrett and Ben Smith to turn a close-run contest into a rout, at the end. I was always confident that the Wallabies would beat the Springboks at Brisbane (in South Africa could be a different matter). But I am less confident about the outcome next weekend of the Wallabies and the Pumas at Perth. The Pumas, judging by their play at Hamilton, will present a far more significant test of the Pooper option, the Cooper/Foley combination, and the playing of Reece Hodge, Samu Kerevi, and Israel Folau out of position in the backline than the Springboks did at Brisbane. Because the Wallabies are playing at home and because there were promising signs of recovery at Brisbane, I am predicting a victory for them at Perth. But this is a fearful rather than a fearless prediction.